Milwaukee Journal Sentinel reporter Tom Content concludes that Wisconsin's PSC has been far more generous to utility requests to raise monthly fixed charges on customers than regulators in other states. His article relies on research and testimony that RENEW Wisconsin submitted in Alliant Energy's pending rate case, which contains a proposal to increase the fixed charge on residential customers from $7.56 today to $18 in 2018. In our direct testimony, RENEW urges the PSC to cap any increase approved at no more than $12/month, in line with the fixed charges assessed on residential customers in Sun Prairie and Stoughton, which are both served by municipal electric utilities surrounded by Alliant. Read the full article online here, or below. As Alliant Energy Corp. seeks to more than double its fixed customer charge on monthly electric bills over the next two years, a review of rate cases around the country finds that regulators in other states are taking a dimmer view of these proposals than Wisconsin. Critics say the proposals to increase fixed fees, also known as monthly customer charges, penalize apartment dwellers and those who have taken steps to conserve energy. Utilities say they're a fairer way to pay for the utility system. Over the past two years, Wisconsin utilities have been aggressive in seeking big expansions of the customer charge, and the state Public Service Commission has been receptive, granting average increases of about 66%. But around the country, as the issue has received more attention, 48 different utilities that have proposed to increase the fixed charge by at least 52% have had to settle for about one-fourth of that — just a 14% increase. The increases represent a strategy that utilities turn to as a way to boost revenues at a time when electricity sales growth has flattened, with the prevalence of energy-saving devices and efforts by some customers to conserve to keep costs down. Utilities say they're trying to have the fixed portion of the bill start to represent parts of the utility system that don't fluctuate with the price of energy. But consumer advocates say the changes penalize those who use little energy or have taken steps to conserve. A key bone of contention between utilities and their critics is whether these fixed charge hikes pose a chilling effect on whether to conserve energy. However, what is clear is that electricity customers who do not use a lot of energy face the biggest percentage price increases from moves to hike fixed charges. 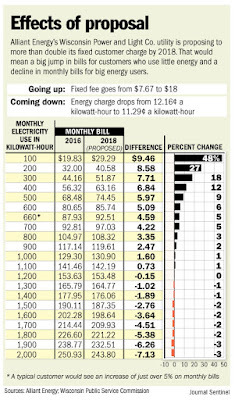 An analysis of the impact of the rate changes proposed by Alliant's Wisconsin Power and Light utility shows how the proposed charges would affect different kinds of customers. 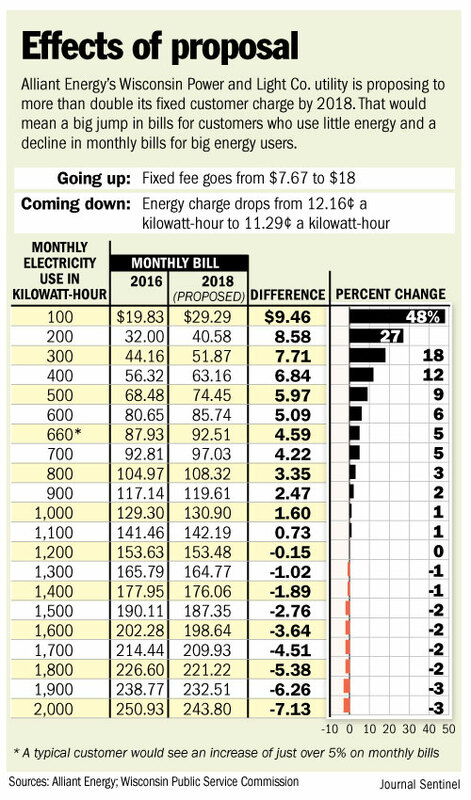 Under Alliant's proposal, a customer who uses a typical amount of electricity every month would see fees increase of about 5% by 2018. But a customer in a very large home, using twice as much power each month, would see bills drop by 1% by 2018. And someone who uses half as much power as the typical customer, whether living in a small apartment or having taken steps to cut back on power use, would see a much bigger increase of 17% in monthly bills. Apartment dweller Hank Jacobi in Milwaukee says customers should be aware of the impact of fixed charges. He recalls when the We Energies charge was just 20 cents a day, and now it's 52. Jacobi spent more than two months in the hospital after a bicycle crash. When he returned home, he found that his monthly bill had gone up by about 26%. "When I was away form home for 82 days, the fixed charge was still getting me," he said. "It’s the charge you cannot avoid, no matter how many lights go off." Jacobi said it's not that he can't afford to pay more. But the 75% increase granted to We Energies in 2014 adds up to $82 a year for him. In a case now pending in Madison, Alliant Energy's Wisconsin Power and Light Co. utility contends that recent PSC decisions involving other utilities show that its own fixed charge is well below the pack. After recent increases, Alliant's fixed charge stands at just $7.67, well below We Energies ($16 a month), Madison Gas & Electric Co. ($19) and Wisconsin Public Service ($21). Alliant's proposal calls for more than doubling the charge, starting with a 56% increase in the customer charge in 2017, to $12 from $7.67. That would be followed by a 50% increase, to $18 a month, in 2018. The total increase: 135%. "While the customer-charge change will increase bills for low users and decrease bills for high users, the change itself is neutral for the average customer," Brian Penington, director of regulatory affairs at Alliant, said in a filing with the PSC. "On the whole, residential customers will experience a small increase ... but WPL’s residential rates will continue to be among the lowest rates for Wisconsin’s large investor-owned utilities." Other states are taking a more skeptical view of fixed-charge increases, with some regulators rejecting any increase because it would discourage energy conservation. Since 2014, 48 utilities in states other than Wisconsin have proposed to increase their fixed charges, by an average of 53%. A review of regulators' decisions, compiled by the advocacy group Renew Wisconsin, found that commissions kept half of those fixed charges unchanged, and the average increase was 16%. Inside Wisconsin, the PSC has approved much larger increases, with utilities seeking 96% on average and receiving 66%. But the commission in recent cases has given the utilities somewhat less, Renew Wisconsin says. The utility says the cost of equipment to connect customers to the power grid has risen over the years, but its customer charge has remained in the range of $5 to $8 a month for more than two decades. "Because we collect more of the power grid’s overall costs in the per-kilowatt-hour charge, and because we haven’t raised our fixed charge in many years, over time low-use customers have begun to pay less than what it costs to serve them," said Annemarie Newman, a spokeswoman for Alliant. A majority of the lowest energy users on the Alliant system are either vacation homes or cottages, according to the utility. Renew Wisconsin policy director Michael Vickerman said the increase "puts a larger portion of customer bills off-limits to potential savings from actions initiated by customers" to make their homes more energy efficient or to add solar power. Renew urged the commission to cap Alliant's fixed charge at $12 a month, which still would be a more than 56% increase from the current fee. Jonathan Wallach, representing the customer group Citizens Utility Board, recommended the PSC limit Alliant's customer charge to $9. Nearly 100 Alliant customers have weighed in against the utility's proposal in public comments filed with the commission. A public hearing is scheduled for Sept. 28 in Madison. A decision by the PSC is expected late this year. Alliant has about 465,000 electricity customers across the state, mainly in southern and central Wisconsin.